It is the fact that Cambodian cuisine shares many same features with the cooking of its neighbors, especially that of Vietnam. Both Vietnam and Cambodia have a shared history of colonization by the French and part of southern Vietnam used to be part of Cambodia not so very long ago, so there are many dishes which are widely known as Vietnamese are also common in Cambodia. For instance, those tasty Paris baguettes, known as banh mi in Vietnam, are just as common in Cambodia, with the name of num pang pâté. 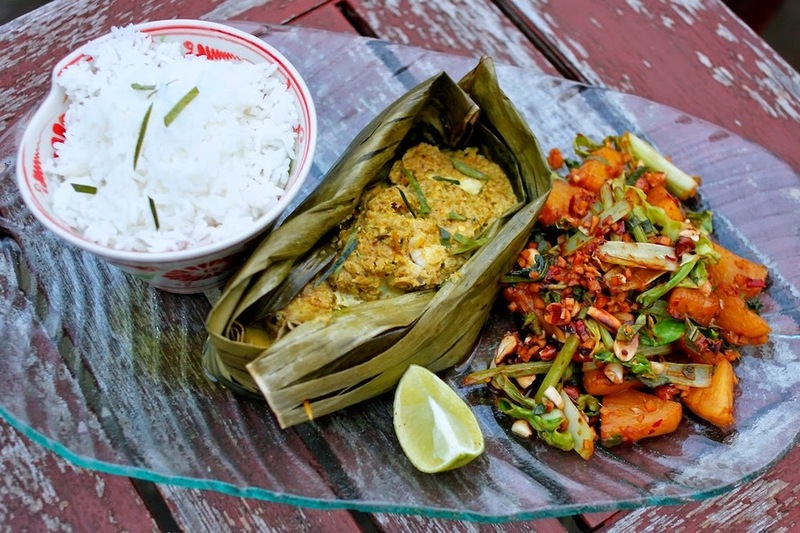 Even though Cambodian dishes usually contain less coconut milk, less sugar and less chili, other Cambodian dishes are more similar to Thai food. Bobor, rice porridge similar to Chinese congee, is a typical Cambodian breakfast. 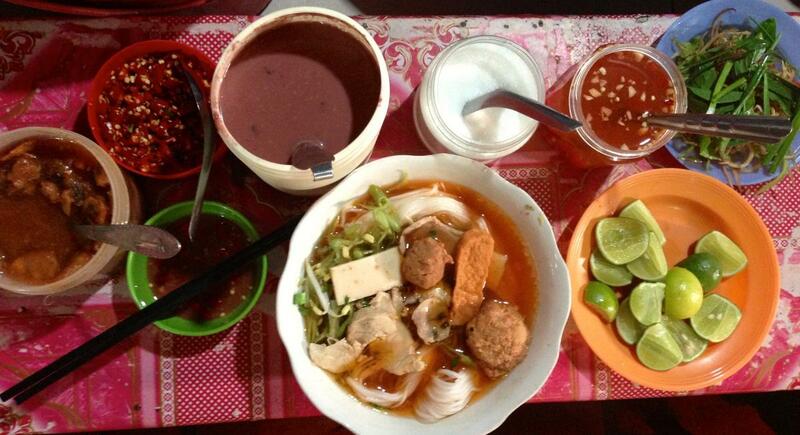 At the Cambodian breakfast table, rice and rice noodles figure heavily. Sometimes known as the Cambodian national dish, nom banh chok, rice noodles topped with a kind of fish-based green curry gravy made with kaffir lime, turmeric root and lemongrass, is a favorite way to begin your day. Kuy teav, a soup made from rice vermicelli and beef or pork bones and topped with bean sprouts, green onions and fried shallots, is another popular breakfast noodle preparation. One of the simplest and most delicious breakfast options of Cambodians is bai sach chrouk or pork and rice. 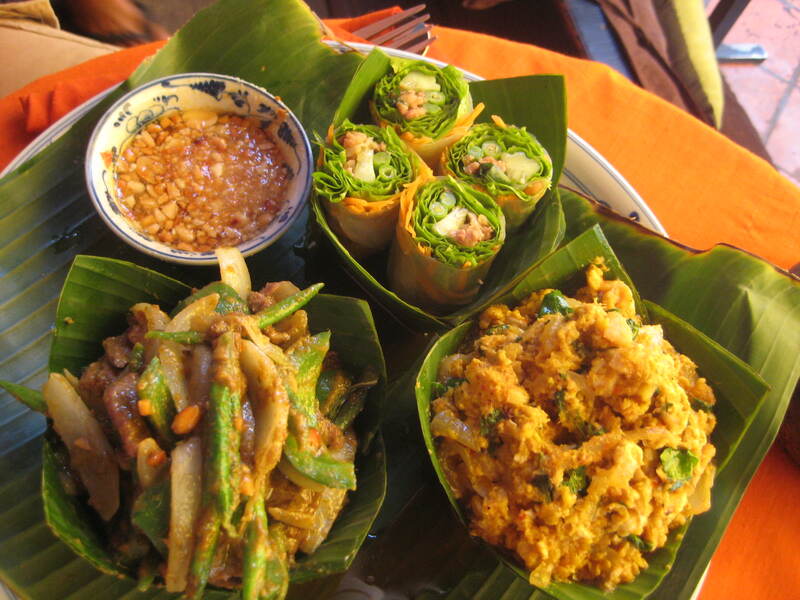 Snacking, particularly snacking on street food, is a favorite Cambodian pastime. The street food cooked right in front of you and served hot, which kills off bacteria, are the best choice for those who are worried about getting sick. Ice, which is specially made in ice factories, is also usually fine. 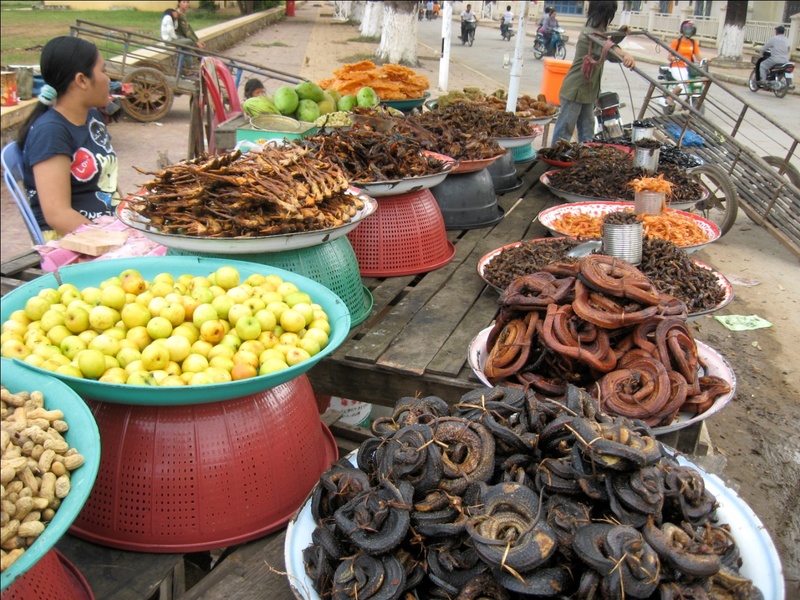 On Cambodia’s streets, at different times of the day, you can find different snacks available. While vendors offer breakfast dishes such as bai sach chrouk and kuy teav at small roadside stalls early in the morning, from late morning through afternoon, you can find so many roving vendors sell fresh cut-up fruit. Late in the afternoon, students crowd the streets to enjoy such restoratives as barbecued beef skewers tucked into baguettes and topped with a green mango slaw or crispy spring rolls.